In many ways, Austin, Texas, is a playground. Whatever your recreational preference, Austin likely has it. The city is, after all, in the heart of the Texas Hill Country, which boasts state parks, rivers, swimming holes, cliff walls, and every other type of outdoor destination imaginable. Land-goers and water-lovers alike have countless ways to choose to spend their time outdoors. Here are nine reasons Austin has become a mecca for lovers of the outdoors. Lady Bird Lake. Credit Johannes Schneemann, courtesy of RootsRated. Lady Bird Lake is a reservoir created by two dams on the Lower Colorado River, which flows through downtown Austin. Motorized boats aren’t permitted, so Lady Bird Lake is a perfect destination for kayakers, canoers, and stand-up paddleboarders. With the Hike and Bike Trail on both sides of the lake, in addition to Zilker Park, Barton Springs, Red Bud Isle, and Festival Beach along its shores, a day spent on the lake offers countless opportunities for recreation. Plus when you’re finished, enjoy cocktails at any of the establishments along Barton Springs Road. Barton Creek Greenbelt. Credit Sean Loyless, courtesy of RootsRated. 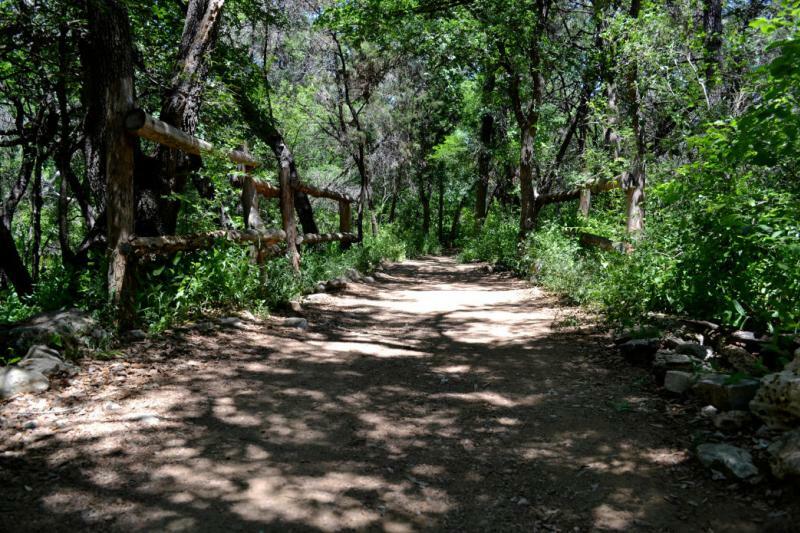 While the greenbelt meanders throughout the city, the Barton Creek Greenbelt boasts almost 13 miles of trails. Barton Creek passes both Sculpture and Twin Falls - steep cliffs that are great for climbing - and this section of the greenbelt features lush forest that’s great for a plethora of activities. Whether you prefer to hit the trail on two feet or two wheels, you can look forward to enjoying typical Hill Country landscapes and scenery along the way. Reimers Ranch. Credit ClimbTexas, courtesy of RootsRated. 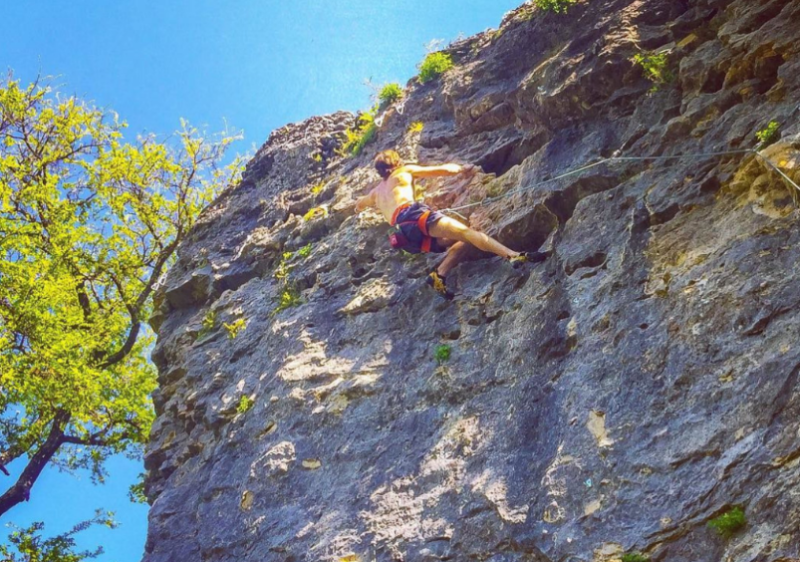 As mentioned, the Barton Creek Greenbelt is a great destination for climbers, but several other parks just outside of Austin also offer great rock-climbing terrain. Reimers Ranch (on the same stretch of road as Hamilton Pool) provides highly technical cliff walls that skilled climbers love to practice on. 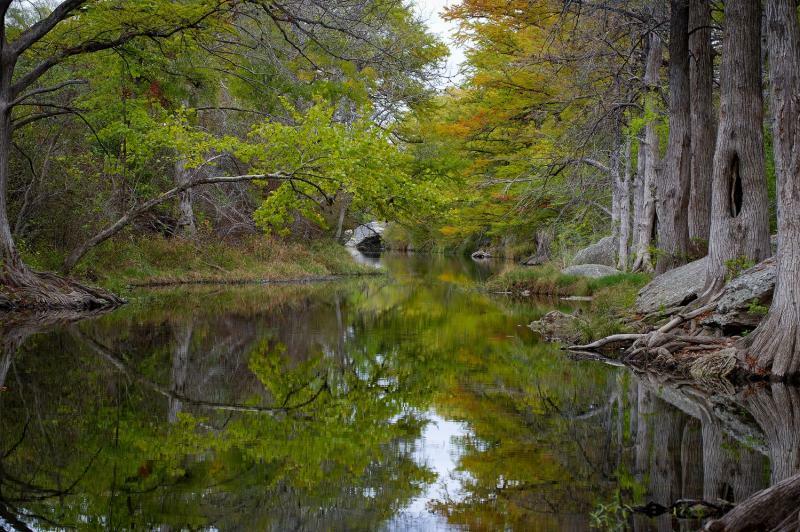 Pedernales Falls offers varied terrain along the Pedernales River. It offers wild bouldering opportunities with rocky riverbeds and giant boulders scattered from the shorelines to the center of the river. Biking at the Hike & Bike Trail. Credit Nick Simonite. 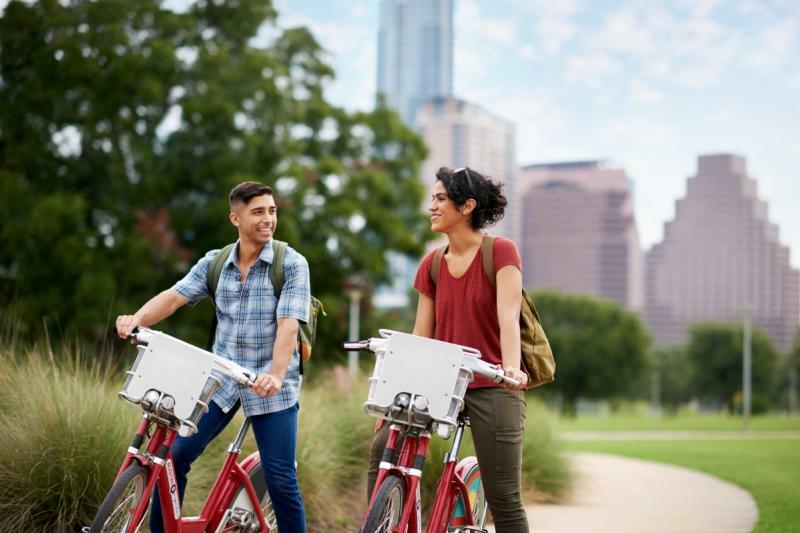 Austin features a strong cycling culture, with local bike shops providing anything you need from rentals to guidance. At Mellow Johnny’s, to name just one, you can shop, rent gear, and grab a coffee as you talk shop with the locals. You’ll find endless trails to explore both in and out of the city. Mountain bikers will enjoy the off-road routes found on the in-town greenbelt and at nearby parks like Pedernales Falls. Or take a leisurely downtown ride along the Hike and Bike Trail. Road bikers will find plenty of open road outside of town, including the Willow City Loop, where you can rack up endless scenic miles in the Texas Hill Country. McKinney Falls State Park. Courtesy of Texas Parks & Wildlife. Whether you prefer staying closer to the city or you’re looking to get a bit farther away, you’ll find state parks and recreation areas in every direction of Austin. Some of the closer parks include Emma Long Metropolitan Park, Windy Point, McKinney Falls, Walter E. Long, Red Bud Isle, and Hippie Hollow. If you go a bit farther away, you have parks like Palmetto State Park, Pedernales State Park, Reimers Ranch, Narrows Recreation Area, Enchanted Rock and Muleshoe Bend Recreation Area, among many others. Whether you’re looking for a place to set up camp for a night, well-kept hiking trails, or steep rock walls for river diving, Austin’s surrounding parks have something for everyone. Hill Country Bluebonnets. Credit Rob Greebon. People often misconceive Texas as a dry, colorless climate - and they couldn’t be more wrong. 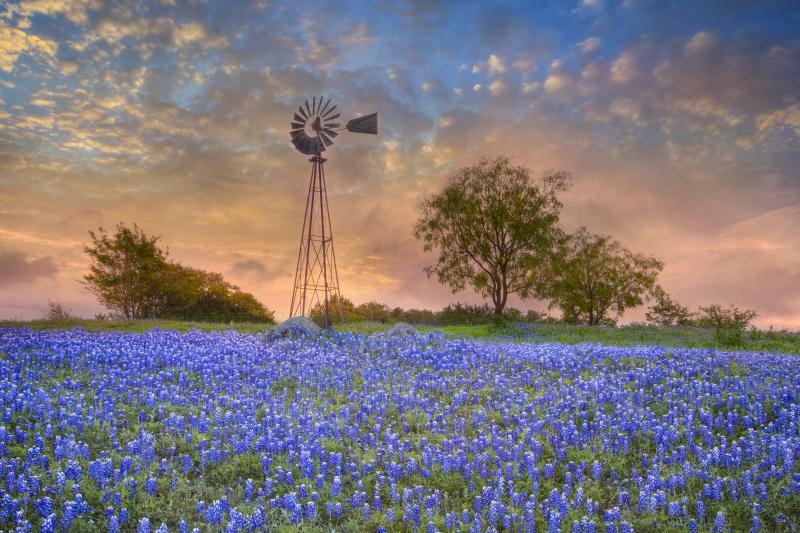 Central Texas in particular is wildly colorful, especially in the spring when the bluebonnets begin to blossom. The meadows, countrysides, and roadsides are lined with wave after wave of seasonal bloom, including Indian paintbrushes, poppies, Queen Anne’s lace, and rain lilies. From March through October, it’s one color after another, making for amazing hikes, photography, and wildflower drives both in and outside of the city. Hamilton Pool. Photo Credit Dave Mead. With so many rivers in the area, it’s no surprise that you’ll find numerous swimming holes in the Greater Austin area. Within the city limits, you’ll find two spring-fed pools: Barton Springs and Deep Eddy, both of which are open year round and are long-time Austin hot spots. Outside of town, you have swimming holes like Jacob’s Well, Hamilton Pool and Krause Springs, all providing unique landscapes, crystal clear water and cypress shade. 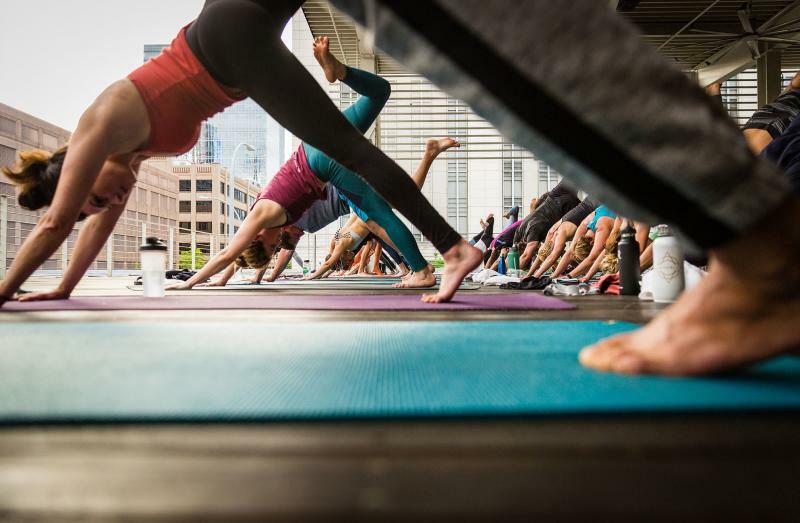 Yoga is all the rage in Austin, and outdoor yoga has become a popular draw. For one, the flagship Whole Foods on North Lamar offers seasonal yoga classes on its rooftop - for free. 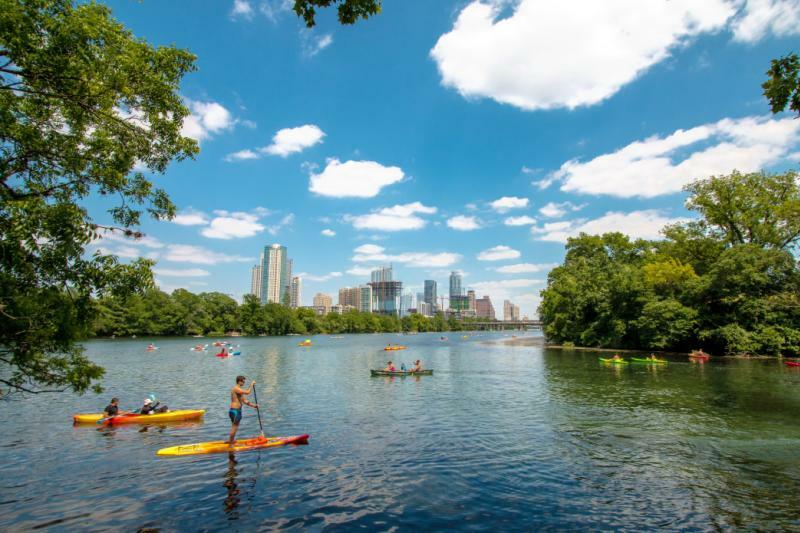 In addition, you can find studios teaching outdoor classes at places like Auditorium Shores, or on stand-up paddleboards on both Lady Bird Lake and Lake Austin. However you like to flow, there’s a teacher and studio in Austin with an outdoor opportunity. Courtesy of Jester King Brewery. From breweries to old-school dive bars, there are patios all over the city where you can celebrate your feats in the outdoors. 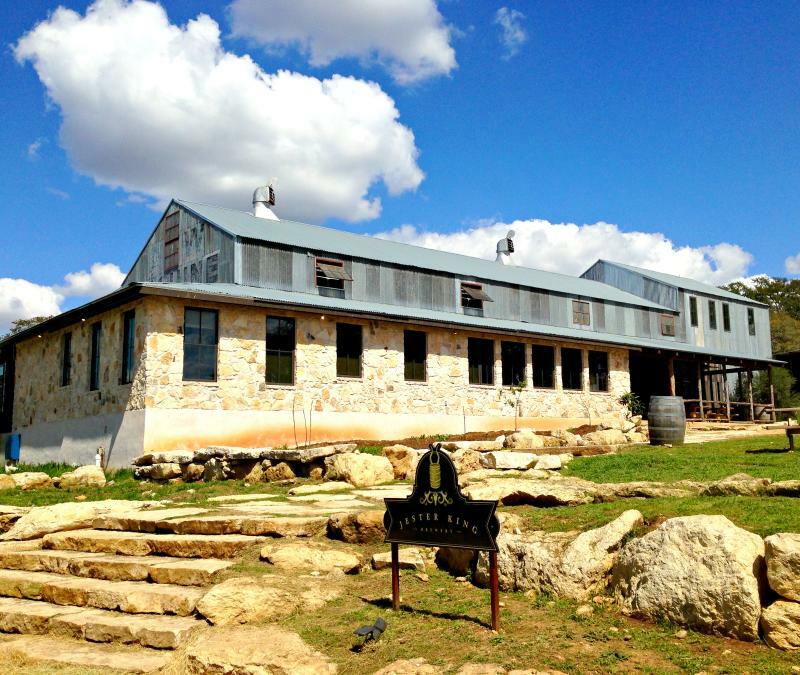 Jester King and Live Oak breweries are both outside of town (in different directions) that have incredible patios and house-made beer. In Austin, Rainey Street is a local haven for patios, tacos, shade trees, and much-deserved drinks. Banger’s has a wonderful outdoor area, top-notch sausages, and a great beer selection. If you’re feeling a bit more upscale, Hotel San Jose has a great outdoor area surrounding its desert-vibes pool.